Summer is just the best time of year, don’t you think? The weather is warm and there is so much time to be creative with these fun July crafts for kids! These awesome July crafts for kids are so much fun! 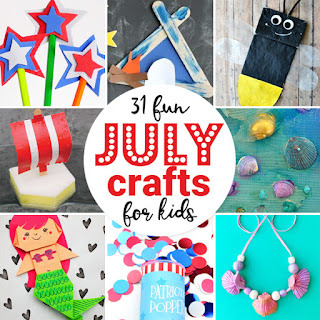 There is enough craft ideas on this list for you to try a new craft every day in July! Celebrate the Fourth of July with some fun crafts, make some cute firefly themed crafts and some awesome camping crafts. There is also lots of other July crafts for the kids to make and enjoy including some mermaid and seashell crafts! Sparkler Firework Craft from Kids Craft Room. This is a fun and easy craft, and it’s perfect for little ones that may be scared of real sparklers. Pipe Cleaner Fireworks Painting from Where Imagination Grows. What a fun painting activity with such cool results! Firework Rockets from Creating Creatives. These little rockets really fly! Patriotic Necklace from Buggy and Buddy. This easy to make necklace would be perfect to wear to a Fourth of July parade or party! 4th of July Party Poppers from Simple Everyday Mom. 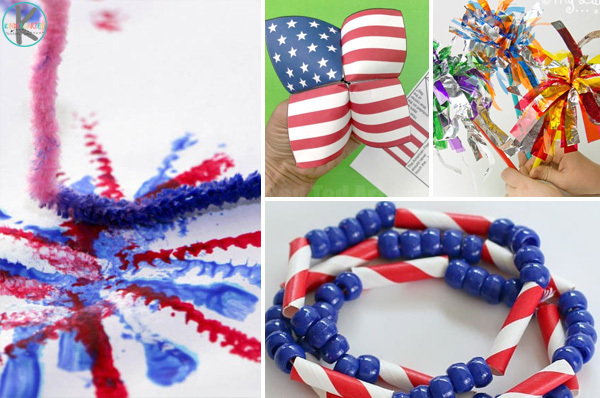 Make your own patriotic party poppers! These ones don’t make a loud noise so they are great for little ones who might be frightened. USA Star Pencil Topper from Easy Peasy and Fun. These pencil toppers are such a cute way to celebrate the Fourth of July! American Flag Cootie Catcher from Red Ted Art How fun is this free printable USA themed cootie catcher! Patriotic Bubble Blowers from Pint-sized Treasures. These look easy to make and would be so much fun on a sunny fourth of July! Popsicle Stick Tent from Glued to My Crafts. These cute little tents are easy to make and would also be great to use in small world play. Glowing Campfire craft from Buggy and Buddy. This campfire craft really glows! So cool! Gone Camping craft from Simply Learning. 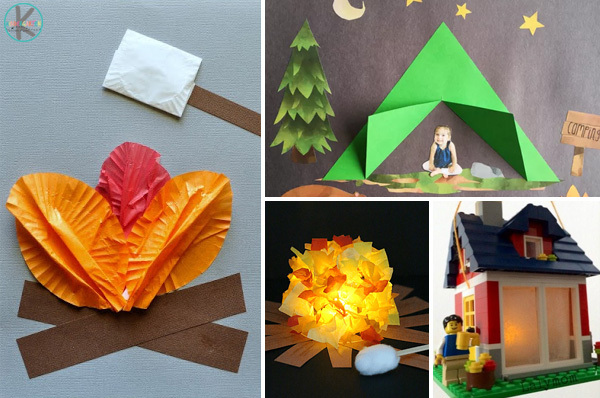 I love this gorgeous camping craft, and it comes with free printables to cut and paste. DIY Mini Camping Set from Artsy Craftsy Mom. How cute are these mini tents, perfect for soft toys to camp in! Cupcake Liner Campfire Craft from I Heart Crafty Things. I love that this craft includes a marshmallow to roast over the campfire! Camping Story Stones from Playdough to Plato These story stones are great for story telling and imaginative play, and easy to take with you if you are travelling. Lego Camping Lantern from Lalymom. This lantern is made from Lego! How cool would it be to take on a camping trip! Pop Bottle Firefly from One Little Project. This is a super fun craft to make using recycled pop bottles! Paper Towel Roll Firefly Craft from Buggy and Buddy! Read The Very Lonely Firefly by Eric Carl and then make this gorgeous craft to match. Glow in the Dark Firefly Jar from Come Together Kids. This is such a simple yet clever idea! Fingerprint Bug Jar Craft from Messy Little Monster. Fill your jar with fingerprint fireflies! 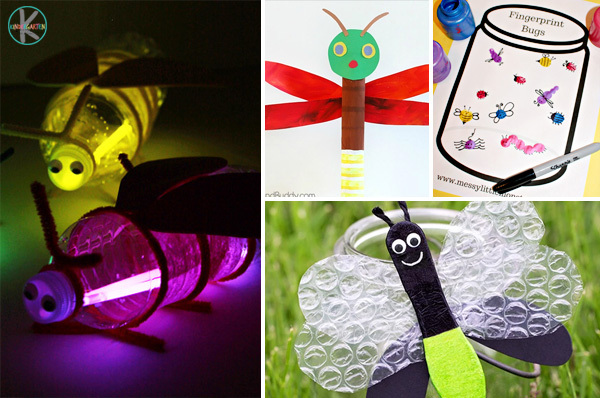 Firefly Craft from Kids Activity Blog. I love the bubble wrap wings on these little fireflies! Paper Bag Lightening Bug from I Heart Crafty Things. This is such a cute craft. I can imagine a whole wall filled with these cute little bugs! Milk Carton Sailboat from Celebrating With the Bug. You could float these boats in your paddling pool, at the beach, or race them down the river! Sponge Boats from The Craft Train. Here’s another easy to make boat to float! Nature Mermaids from Mother Natured. 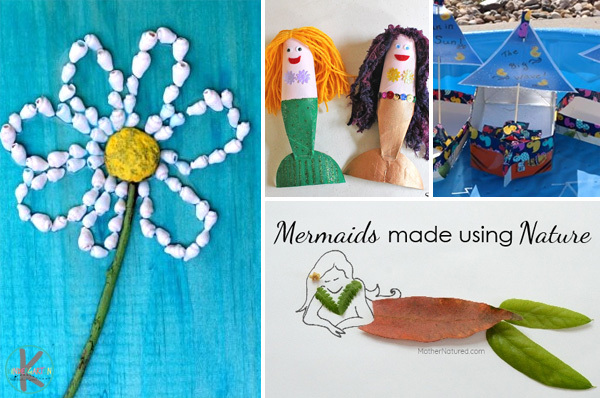 These mermaids made from leaves and flowers are gorgeous, and there is a free template to help get you started. Origami Mermaid from Picky Stripey Socks. Who knew you could make an origami mermaid?! There is step by step instructions so everyone can have a go. Cardboard Tube Mermaids from The Craft Train. It’s amazing what you can make from a cardboard tube! These mermaids are adorable! Honeycomb Craft – this is a simple craft for kids to celebrate summer bees! Mermaid Shell Necklace DIY from Creating Creatives. Every mermaid needs a shell necklace! There is a video tutorial to go along with this fun craft too. Popsicle Stick Lemonade Stand from Glued to My Crafts. Make this cute lemonade stand craft, then have a go at making some real lemonade! Amazing Bubble Artwork for Kids – this craft is almost as much fun to make as it is beautiful! Paper Play Seashell Craft from Artsy Craftsy Mom. This gorgeous craft combines a few different art techniques to create gorgeous shells. Sea Shell Collage from Art Bar. This easy activity makes a gorgeous piece of art ot hang on your wall, or give as a gift. Tissue Paper Butterfly Craft – these butterflies are fun to make and look so pretty! Squirt Gun Painting – this activity is a blast to create! 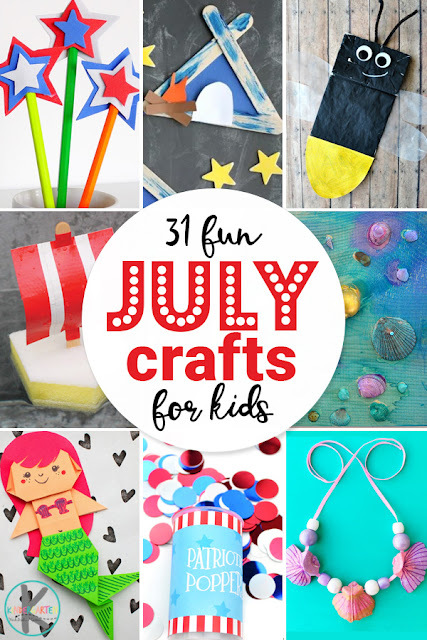 You’ll be busy all month long making these 31 fun July crafts for kids!